When it comes to ghost stories, I like originality and inventiveness. Too many horror authors regurgitate the same plot lines over and over while trying to put a unique spin on them. Unfortunately, many times, these fail. Author Robert Hood is a horror author who thinks outside the box with his ghost stories, and the resulting tales are anything but ordinary. Peripheral Visions: The Collected Ghost Stories is a massive collection of these extraordinary tales, and it is a must-own for any fan of horror fiction. 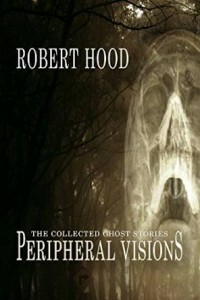 Peripheral visions is a unique reference collection that includes all of Robert Hood’s 44 ghost stories to date, three of them especially written for this volume. These memorable tales display Hood’s uncanny ability to make the fantastic real, to embrace weirdness and create human characters whose lives – both inner and outer – haunted by mortality, are laid bare and revealed to be our own worst nightmares. Ranging from melancholy reflection on life and death, through disquieting tales of dark humour and vengeance, to chilling visions of ghostly apocalypse. Hood’s stories are sure to draw you into a terrifying world that in the end is revealed to be irrefutably our own. Though many of these stories draw on the traditions of the past, they are far from traditional in approach. As you turn each page remember this: not everything here is as it seems. There’s always something more, barely glimpsed, out there on the periphery. Every story in Peripheral Visions is written well and shows careful construct and consideration. Hood’s work does not pander to over-expressive literary types; instead, he writes in a down-to-earth manner that allows even the most commonplace of readers enjoyment. The characters in each title are believable and damaged. Some are likable, while others are not. But regardless, each offers ample reasons for the reader to be invested in them. As a result, each tale is completely immersive and offers great entertainment value. One of my favorite stories is “Guard Dog.” In this tale, young Ruba is terrorized by the appearance of a dog on her well-worn path to school. But this dog is not what it seems, and it will play a pivotal role in an important event pertaining to young Ruba. I like this story because of its simplicity and the twist ending you can see coming. Although the ending is pretty evident as to what’s happening, it’s still an enjoyable read nonetheless. Peripheral Visions is a major win for me, and I highly recommend it. Fans of ghost stories and horror fiction in general will want to check this one out. The book is available now in a variety of formats.